Regular “Peace Missions” conducted under the SCO have been the best-known component of its efforts. The effects of the Tiananmen Square incident continue to ripple through China, but surprisingly little has been said about what China has done in the field of counterterrorism. A vehicle ran through crowds of tourists and was lit on fire in front of the entrance to the Forbidden City under the gaze of Chairman Mao Zedong’s portrait. Official Chinese media have labeled this incident a terrorist attack and made links with the mysterious East Turkistan Islamic Movement (ETIM) with alleged ties to al-Qaeda and transnational jihadist elements. If the official narrative is to be believed, this marks a milestone in the history of terrorism in China: the effects of terrorism in the PRC’s restive west, long trumpeted by Beijing as the justification for its “strike hard” campaigns and strict regulation of the region, have now touched China’s east. China’s policies in Xinjiang are well documented by Western and Chinese analysts alike. On the one hand, those who doubt the official line about Uyghur jihadists fomenting insurgency in Xinjiang point to socioeconomic discrimination, a lack of religious freedom, and Han-Uyghur ethnic tensions as the drivers of the region’s conflicts. On the other, those who accept the official line oftentimes place the “Uyghur issue” in the classic framework of liberty versus security. While curbing freedoms in Xinjiang for Uyghurs is unfortunate, so the logic goes, it is a necessary evil for the sake of stability. Setting this controversial debate aside, if China is truly concerned with a terrorist threat, what has it done to develop counterterrorist capabilities? The most prominent Chinese efforts to develop counterterrorist capabilities lies in joint military exercises conducted under the name “Peace Mission.” Under the Shanghai Cooperation Organization (SCO) framework, China and Russia are the key players, though other member states also participate. The SCO officially works to fight the “three evils” – ostensibly terrorism, extremism and separatism although seen by many Western analysts as cover for suppressing civil protests and democratic movements. In addition to the Peace Missions, the SCO also has a permanent institution hosted in Tashkent, the unfortunately named Regional Anti-Terrorist Structure (RATS), which facilitates intelligence sharing among SCO members. RATS also maintains a list of terrorists and organizations that it identifies as presenting a threat to the region’s security. In 2007, Russia requested that the Peace Missions be held under the joint framework of SCO and CSTO, but Beijing denied the request. Rather, the Secretariats of the SCO and CSTO signed a Memorandum of Understanding, which upgraded CSTO-SCO interactions and information exchanges, especially between their anti-terrorist structures. Peace Missions are carried out with the official aim of strengthening antiterrorist capabilities among the region’s militaries. China and Russia usually contribute the most military personnel and equipment, with total military participants involved in Peace Missions ranging from 2,000 to 10,000 personnel. 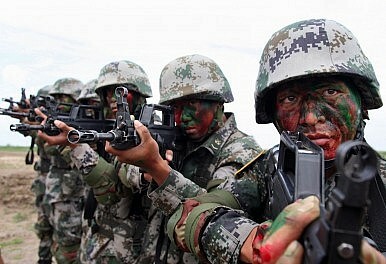 China has participated in every Peace Mission conducted to date. Scenario variations always revolve around a terrorist threat with differences ranging from the number of “insurgents” to the terrain conditions. U.S. analysts have commented that the Peace Missions, especially the earlier ones, featured tactics and heavy equipment ill-suited for a terrorist scenario, wherein insurgents would typically be organized in small groups with high mobility. SCO member Uzbekistan has in the past voiced its objections to the Peace Missions for this very reason. The first Peace Mission was held in 2003 with two phases, one in Kazakhstan and the other in China. Peace Mission 2005 was held on Chinese territory near Vladivostok and Weifang from August 19 to 25. The PLA, PLAN, and PLAAF hosted Russian forces on Chinese territory. Other SCO members, Iran, India and Pakistan sent observers. The joint militaries enforced a mock offshore blockade and staged an amphibious landing and an airborne attack. The governments described the drill as an antiterrorist exercise with the scenario of a state under terrorist attack, even though the heavy equipment and tactics reflected a traditional security exercise. The Sino-Russian forces used conventional assault tactics from the 1970s and 1980s, involving 10,000 Chinese troops and 1,800 Russian troops. Peace Mission 2007 was held in Xinjiang, China and Chelyabisnk, Russia. The scenario proposed a town captured by terrorists, requiring SCO joint forces with air support and artillery to free the town and arrest surviving terrorists. The scenario was crafted in light of the 2005 Andijan uprising in Uzbekistan and Chechen 1999 incursions into Dagestan. In contrast to Peace Mission 2005, this drill lacked heavy equipment, lending more credibility to its stated counterterrorist character. But the alleged terrorism seen in the past several years in Xinjiang usually involve small-scale warfare with long knives and other rudimentary weapons. It is unlikely that a whole town could be captured, let alone a scenario necessitating joint forces and air support.